Heat oil in a pan, add finely chopped onion and allow it to sweat with green chillies. Add in the carrots & beans & allow it to cook until half done. Add in the Ginger/Garlic paste, corn, peas & the peppers & allow it to cook. Add in Kashmiri chilli powder & cook well to remove raw flavour. 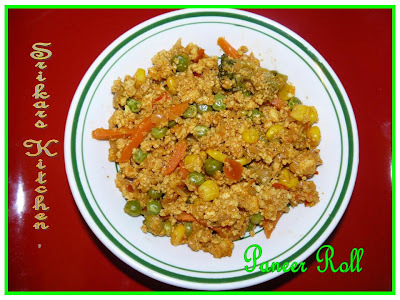 Add in the crumbled paneer & cook it well so that it is dry enough. Allow it to cool. 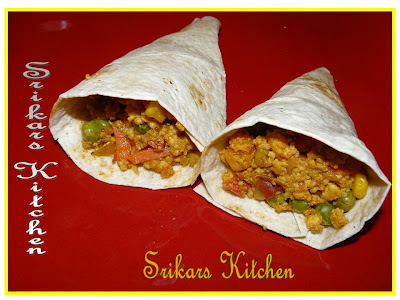 Make chappatis or use tortilla rolls which is normally used in mexican cooking. Roll the chappatis or tortilla roll to cone shape & stuff the mix inside & serve. Can be done in different shapes as well & good for a snack or mini parties. Divya of ..and a little bit more has passed me "GOOD JOB" Award, thxs a lot dear. I would like pass this Award to Rekhas kitchen,Purva, Anusriram, Raaji , Jaishree ,Rajeswari ,Usha & Valarmathi. It's my first time here and you have such lovely recipes! I can't wait to try some of them. Congrats on the award and the paneer sounds delicious. Nice rolls, I just had lunch and I am hungry again already! ooh, the paneer roll looks so delicious and filling. Congrats on your awards. paneer rolls look yummyy.. i love paneer. .any dish made with paneer tastes awesome...love your dish. rolls looks great..congrates on ur awards..
Wow iam drooling over.Looks tempting. congrats on your award and the paneer rolls look delicious. The paneer roll looks yummy. congrats on the award. They remind me of the paneer kathi rolls... This is sure tobe a hit with kids. love the roll!!! must have tasted Yum! looks like you really love paneer! loved the rolls all filed with so much flavours.